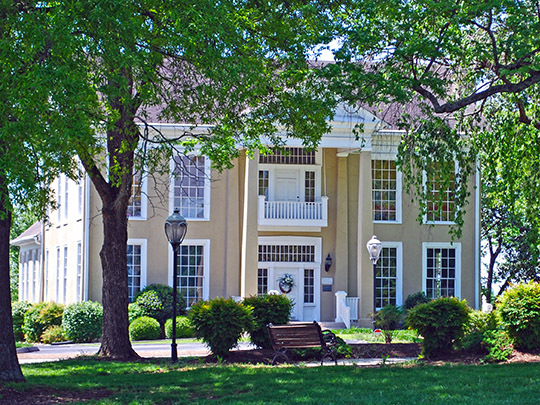 Chattanooga City Hall is located at 101 East 11th Street, Chattanooga, TN 37402; phone: 423-425-7800. Photo: Bonny Oaks, 5114 Bonny Oaks Drive, Chattanooga, TN. Listed on the National Register of Historic Places in 1980. Photographed by User:Andrew Jameson (own work), 2011, [cc-by-3.0 (creativecommons.org/licenses/by/3.0)], via Wikimedia Commons, accessed January, 2013. The settlement of Chattanooga commenced in 1835. At that period, the site of the present city was one vast forest, through which the aborigines roamed at will. In December of the previous year, the treaty for the lands in this section was made with the Indians, and ratified by the U. S. Senate May, 1836. At this time there were but few white men here — a primitive hut did service as a hotel — Daniel Henderson, Esq., father-in-law of Richard Henderson, Esq., doing the honors of the host. The name of the place was "Ross' Landing," taking its suggestive title from John Ross, a distinguished half-breed, who resided here, and the Chief of the Cherokee nation. He educated his daughters in North Carolina — thus evincing his estimate of culture and knowledge. He established a ferry and warehouse at the Tennessee River, and resided at Rossville, 5 miles south of Chattanooga, in Georgia. In 1835, among the white men who settled here were Samuel Williams, Daniel Henderson and John Keeney. In 1836 came Aaron M. Rawlings, Jonathan P. Long, D. A. Wilds, W. M. Davis, Samuel Stewart, William Long and Dr. Nathan Harris. The first post office was established in 1837 with Captain John P. Long as the first postmaster. The first newspaper was the "Hamilton Gazette," by Ferdinand A. Parham. The material for the paper was floated down the Tennessee River in a flat-boat from Knoxville, and placed in a small log cabin on Walnut Street. Politically, the Gazette was a Whig newspaper. The town was laid off into lots in 1838 and sold off in April, 1839. About 250 acres constituted the limits of the new town, which was built near the river, owing to the trade there. The name Chattanooga was given in 1841. Chattanooga was incorporated in 1839. Louis L. Parham, Chattanooga, Tennessee; Hamilton County, and Lookout Mountain, Louis L. Parham, publisher, Chattanooga, 1876.